Students will use professional quality binoculars to discover how to use visual clues to identify different species of birds. 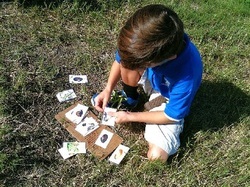 In this inquiry-based activity provided by Around the Bend Nature Tours through the Sarasota Audubon Society, and Manatee Audubon students discover the basic characteristics that make an animal a bird, and learn how to use visual clues to identify different species of birds. Students also learn the basics of using binoculars. Students will discover the agricultural and natural history of the Celery Fields and its importance as a storm water management area for Sarasota County. While engaging in a Limpkin (or Osprey) role-playing game students will discover how difficult it is to survive as a Limpkin (or Osprey). Students will learn that the Limpkin has a specialized diet of apple snails (Osprey: fish). Students will understand that Limpkins and Ospreys have a difficult time surviving due to habitat loss. The best time for scheduling birding field trips is in January, February and March when migratory birds are here.